A unique and historically important pair of Scottish Art Nouveau imposing armchairs and an en-suite centre table, in ebonised oak (now beautifully and richly mellowed) with superbly carved detail; by the Scottish architect-designer, James Salmon (1873-1924) of Glasgow. Salmon was one of the most original architects working in Scotland at the turn of the 19th C. Amongst other projects, he designed the famous Hatrack in Glasgow as well as the building and interiors for the British Linen Bank in Glasgow; a forerunner of the Glasgow Style and Scottish Art Nouveau. 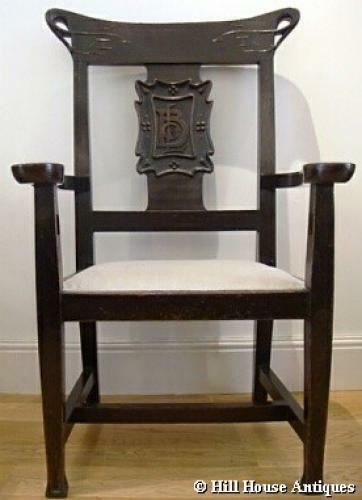 Both the chairs and accompanying centre/side table (the latter with Voyseyesque shaped drawer profile) have the carved monogramme of BLCo, which represented the British Linen Company, which subsequently became the British Linen Bank. These chairs and table ( and accompanying six single chairs available separately) were designed for the Hutchesontown Branch of the British Linen Bank, Glasgow c1901, for what they termed the Agents Room, (Bank Manager). Managers of bank branches in Scotland were (until 1946) known as Agents. This was seen as a highly important job. Agents would be well known and respected throughout their area. They would often have been solicitors or businessmen before being appointed Agent, and many were able to continue their previous career while running their bank. The Agent had to prove himself trustworthy and of excellent character to get the job. As the agents room was the equivalent to a (very senior) managers office today, important customers who needed to speak personally to, or be interviewed by, the branch manager would be invited into that room, so it was important that it created a very good impression with the customers. Ref: James Salmon (1873-1924) by Raymond O Donnell p93, which also shows an archive photograph (from the Royal Commission on Ancient and Historical Monuments of Scotland) of the actual Glasgow Style Agents Room containing this unique suite of furniture. My thanks to Ian Milne of Limehouse Design, Dundee and also to Amanda Noble, Archivist of HBOS Group Archive, for the background research information.